Buybacks used to be a far more regular thing: If you bought a reasonable number of drinks and were a reasonably regular and/or agreeable customer, at some point in the evening your bartender would say, "This round's on me." As this Observer story from the sputtering breaths of the last century shows, the arrangement's been fading for some time, thanks to corporatization, the disappearance of neighborhood spots, the emphasis on volume in some bars, and, in others, the emphasis on cocktails whose prices don't exactly fit the buyback model. But if a just-released app called Swing has its way, the buyback could be making a comeback. 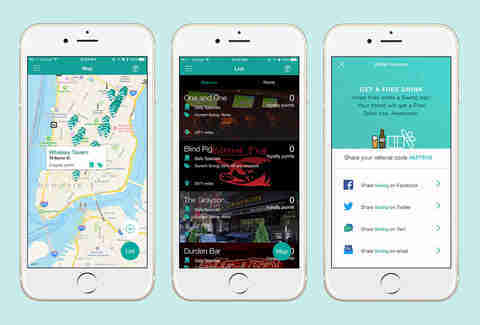 Launching with 28 fine New York City drinking establishments, Swing uses beacon technology to automatically link up with downloaders' phones the moment they walk into a participating bar, no check-in necessary. The bars themselves control what goes out over their hyper-localized Bluetooth connections, allowing each individual bar to send Swing-enabled customers real-time messages while they're on the premises. The uses for bar owners are limited only by their own imaginations -- and their assessments of barroom economics. Most obviously, the bar can send out spontaneous, limited-time specials ("two-for-one whiskey shots for the next 20 minutes!") whenever it's advantageous, particularly those times when a crowd might be wavering between ordering more drinks and dialing up an Uber. 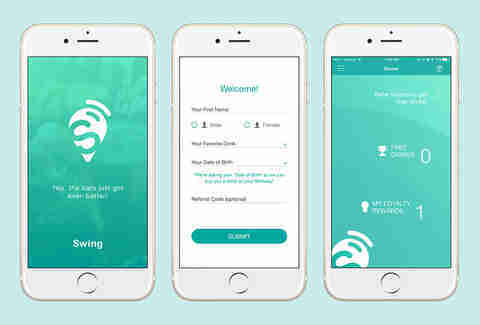 Because the app knows how long you've been in the bar, it can also be used to power loyalty programs, which is where things get exciting for anyone who's been missing that warm buyback feeling. If the bar decides anyone who sticks around for an hour (or two hours, or three hours, etc.) gets a free drink, all it has to do is set the timer and patrons will be pinged when it's time to collect their beverage. There is a hitch to that: If a bar finds that patrons are waiting out the free-drink clock and not ordering booze, it can choose not to turn on the loyalty function. The buyback, after all, is a two-way street -- there can be no buyback without there first being a buy (or, historically, three buys). Digitizing the relationship only makes customer participation more essential. This puts the power squarely in customers' hands: If everyone wants buybacks to be a thing, everyone needs to earn them. Which isn't a bad situation -- everybody drinks, then everybody gets a free drink; the bar stays in business, and the patrons all feel special and save a little cash for a late-night slice. One other note: Not every potential Swing application is financial. The bar could just send a message for everyone to wish someone a regular happy birthday, congratulations on their getting engaged, condolences on their getting engaged, etc. If you're the one receiving that treatment, you're hopefully among the few Americans still getting regular buybacks anyway. David Blend has been with Thrillist since before apps were invented, but after drinking was invented. Follow him @daveblend.